Before you can begin printing from your BarTender software you must install a driver for your printer. Once installed and properly configured you will be able to select your printer from the print dialog in BarTender and print. We recommend using a USB to USB cable, rather than a hybrid USB cable (USB to Serial/ Parallel/ Ethernet). 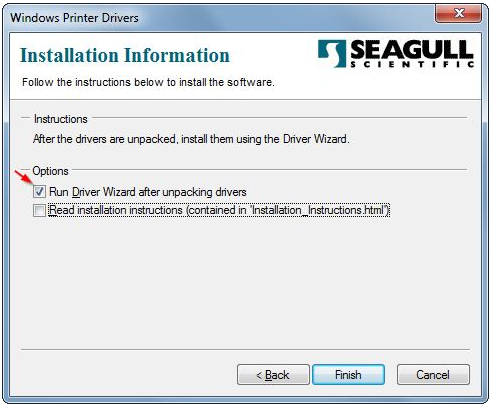 Do not plug in the Printer via USB cable until directed by the Seagull Driver Wizard. Ensure you have a working internet connection. 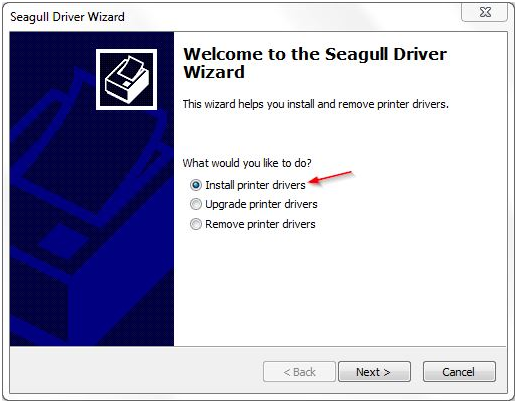 Note: If you are installing drivers from the BarTender install CD, then you can run the Seagull Driver Wizard directly from the CD and proceed to Installing the Printer Drivers. 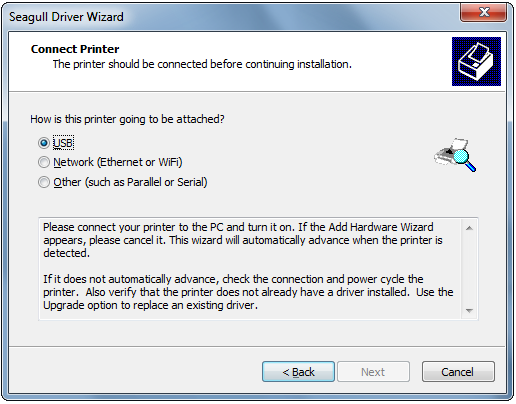 To install a driver for your USB printer begin by downloading the printer driver from our website. Drivers are sorted by manufacturer and can be found here: Seagull Scientific Printer Drivers. Note: If Seagull Scientific does not produce a driver for your printer model, you can still use it with your BarTender software. Please utilize the driver issued by your printer manufacture if this is the case. 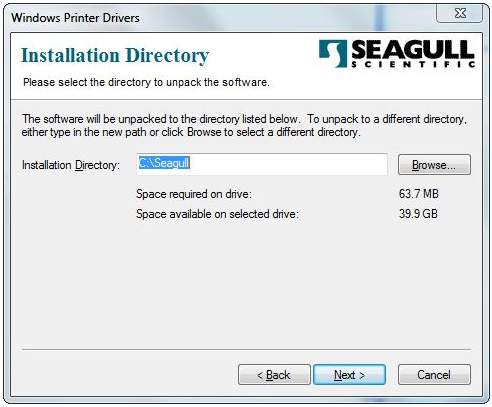 Once you have downloaded the driver from the Seagull Scientific web site, Run the .exe file to extract the driver files to your local hard drive. You will be prompted for an Installation Directory. Unless otherwise required, the default install directory of "C:\Seagull" should be used. Click Next. Make sure that the check box Run Driver Wizard after unpacking drivers is checked. (The 2nd check box can be unchecked if installation instructions are not needed.) Click Finish. 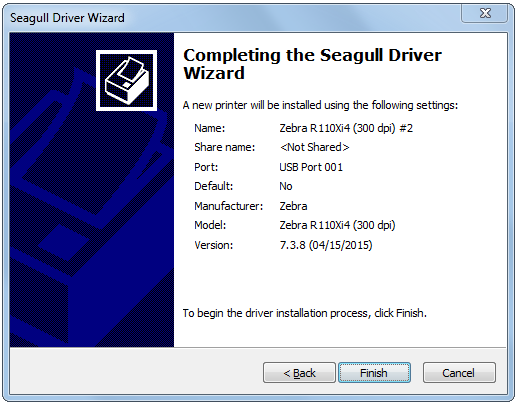 The Seagull Driver Wizard is a tool that will install, upgrade, and remove printer drivers. The wizard will launch automatically after the files are extracted during the step above. Note: If the wizard doesn't launch automatically, or you need to run it again, you can launch it manually by navigating to the directory you chose above ("C:\Seagull" by default). Find driverwizard.exe and double-click it. When the wizard launches you will be presented with 3 options. The options are to Install, Upgrade, and Remove printer drivers. Select Install printer drivers and click Next. Select USB. The plug and play will now search for any USB attached printers. If the printer is not automatically recognized, power cycle your printer. Also verify the printer is not already installed. Once the printer is recognized select it and click Next. 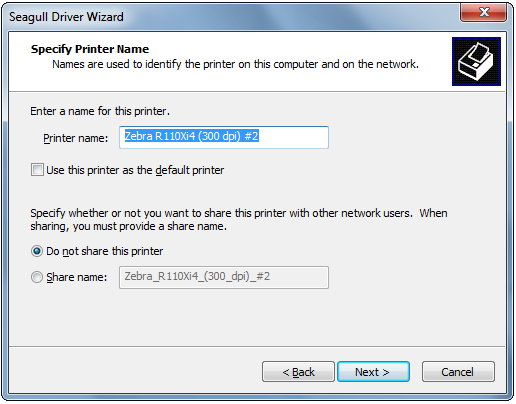 Name the printer and choose whether or not to share it with other users. Click Next. Review the settings and use the Back button to return to any previous panel if incorrect settings were chosen. If settings are correct click Finish. The Printer Driver will now run through the installation. The latest driver installer defaults to an installation path on the user's Desktop. I don't think that's a very good idea. Why isn't it defaulting to a folder under C:\Program Files or C:\Program Files (x86)? I hope someone can change that default and repost the driver installer.